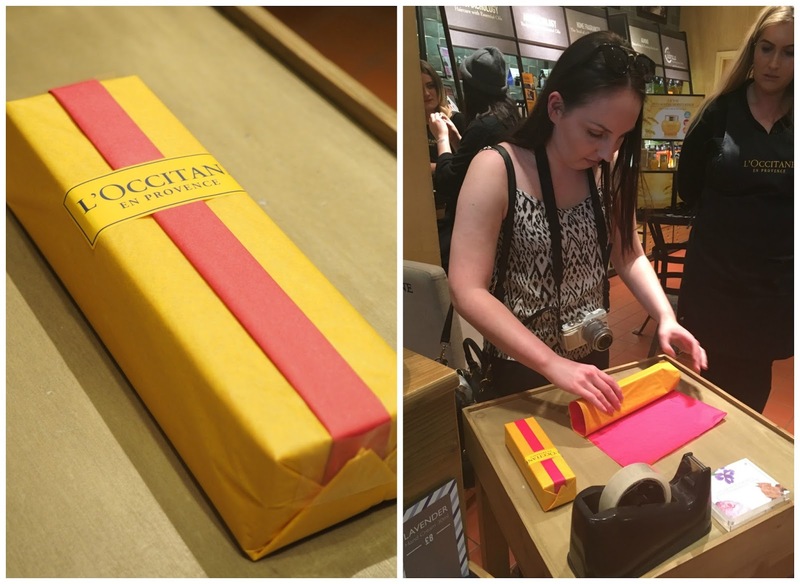 The other week myself and the local blogger crew were invited down to L'Occitane in Highcross, Leicester to help celebrate the fact that this luxury skincare brand have been around for 40 years!! I've been a fan of L'Occitane for a few years, mainly fragrance and body products so this was one event I was not going to turn down. 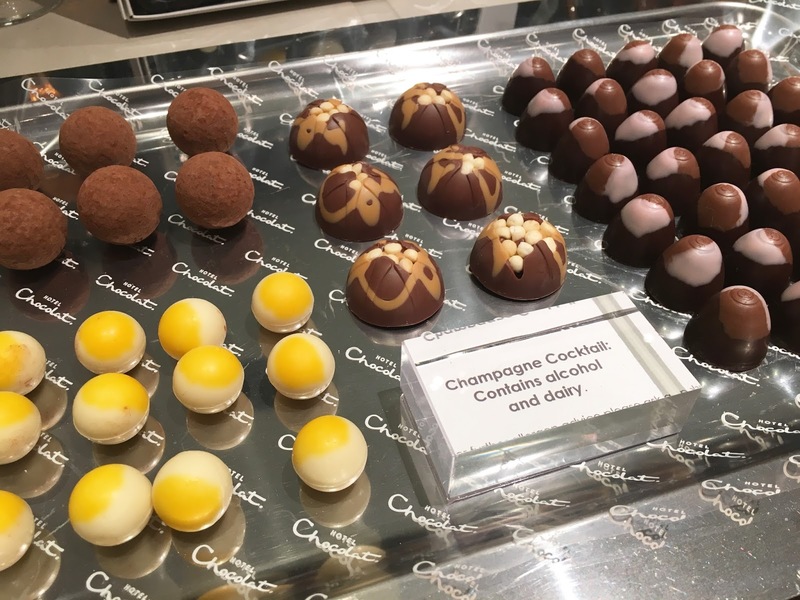 We were offered a glass of rosé wine (french of course) and some divine chocolate treats from Hotel Chocolat, also located in Highcross. As you know I'm not one to turn down anything alcoholic or chocolate-y so I may have had one or two. Or three or four. Chocolates that is, not wine, I would have done but sadly I was driving, I'd given my chauffeur the night off!!! 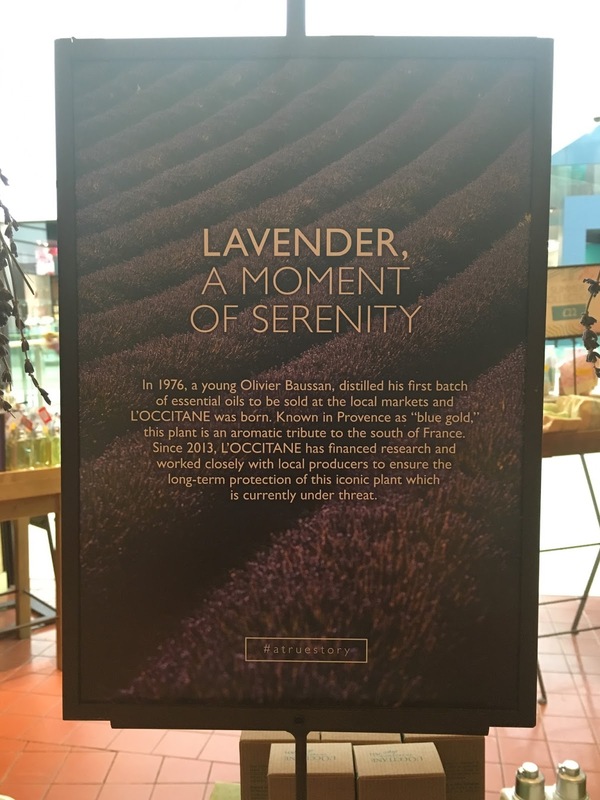 We learnt a little about Olivier Baussan, the founder of L'Occitane who at the age of 23 started to distill essential oils to sell at the local market. His fabulous journey starting in 1976, and today there are thousands of boutique stores all over the world. L'Occitane produce high quality products, striving to use traceable, natural ingredients. Their textures and fragrances are inspired by the mediterranean lifestyle, giving you a moment of well being and sensory delight every time you use them. 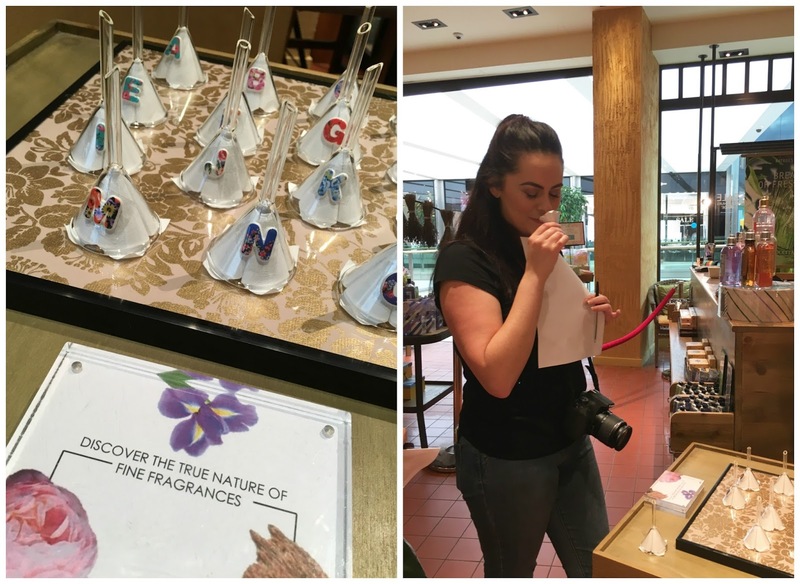 We had the option to take part in a sensory test right there in store with a little fragrance discovery 'game'. Lianne is demonstrating in the shot below, closing her eyes and working her way through the lettered fragranced funnels, (ooh that's a hard one to say!) keeping her favourite out of the two she smelt each time and you basically end up discovering the scent that your senses are truly drawn to by the notes rather than by bottle or the look of a fragrance. Sorry Lianne I can't remember what yours was! We were also treated to a delightfully relaxing hand massage. And a skincare consultation. I had a really good chat with Thomas. He knew his stuff and recommended the Divine collection for me. 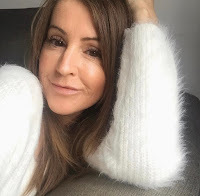 He popped some of the extract and the Divine cream on to my skin and quite frankly I could not believe what a difference it made, how much it brightened and nourished my skin. The range is now on my wish list. I find it very hard not to be drawn into the store when I walk by. They have so many products and gift ideas, all beautifully presented, and not just for the ladies, they have a wide range for men too. They also offer gift wrapping in store and here is Kirstie trying her hand at the French wrapping technique. Plenty of time to practice before Christmas wrapping is required Kirstie! The staff at the store in Highcross are so friendly and are extremely knowledgeable and passionate about the products. I had a super time and want to say a very big thank you for the invite and the very generous goody bag we received. I let out a squeal of delight when I opened it. I love, love, love the fresh scent of Verbena. 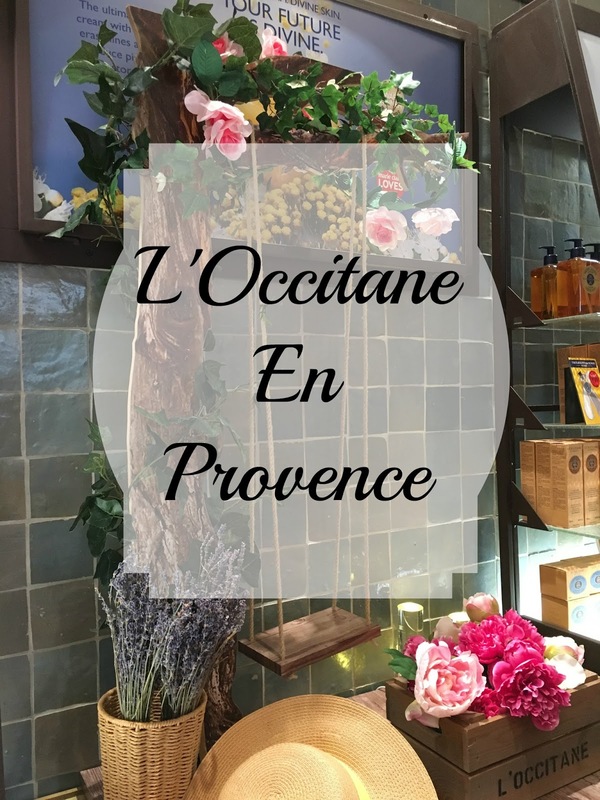 If you want to read more about the 40 history of L'Occitane or their products you'll find details here. 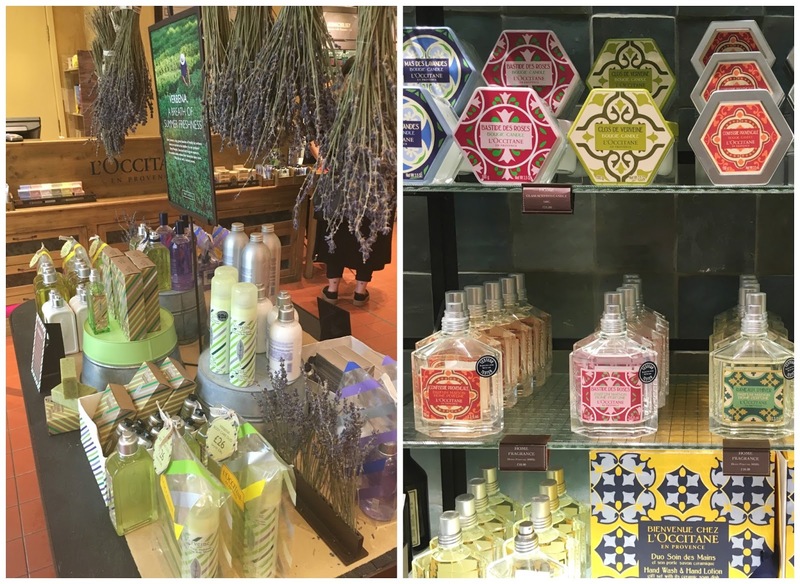 Have you tried L'Occitane products before? What's your favourite? They are my favorite. Back home I planted lemon verbena just to rub it on my body each time I walked by. I have so many L'Occitane favourites. Absolutely love the almond shower oil, the hand creams, shampoos and shower gels. The Divine Cream is pricey but so nice to use.